*NON-ACCUMULABLE PROMOTION WITH OTHER PROMOTIONS. NOT APPLICABLE TO PROFESSIONAL CUSTOMERS. BE RESPONSIBLE. DRINK WITH MODERATION. *NON-ACCUMULABLE PROMOTION WITH OTHER PROMOTIONS. NOT APPLICABLE TO PROFESSIONAL CUSTOMERS. BE RESPONSABLE. DRINK WITH MODERATION. 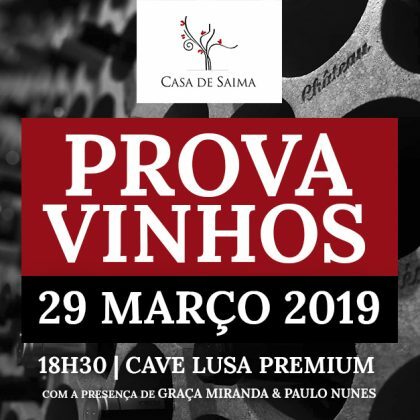 Founded in 2011, the Cave Lusa project was born with a single objective: to find solutions in the wine and spirits market for the needs of its customers, who, from their first contact, accompany the growth of the company. Cave Lusa is a young, dynamic and professional company. The focus is on the end consumer, the Horeca channel (restaurants, hotels and bars) and export. Headquartered in Viseu, it presents itself as a modern and bold wine cellar, with a portfolio for all tastes. The Cave Lusa organizes various events for its customers, including wine tastings and wine tours. Come and discover the origins!